Our Extra Large Smoothie Straws are perfect for use with any thick drink like smoothies, slushy, or frozen coffee concoctions where bigger is better. Straws are non-flex, sturdy, and clear. A basic, quality straw you can't go wrong with. About 7 mm wide, a bit over 1/4"
I like the size of these straws. I am a science teacher and needed this size straw to fit over a regular sized straw. 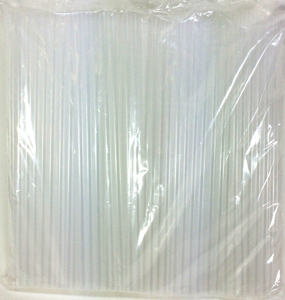 The Large straws were Great, Just what I needed for my project, Fast shipping but shipping was a bit high.